Relieve your baby's aching gums with the Cornelius Brush from Baby Banana Brush! 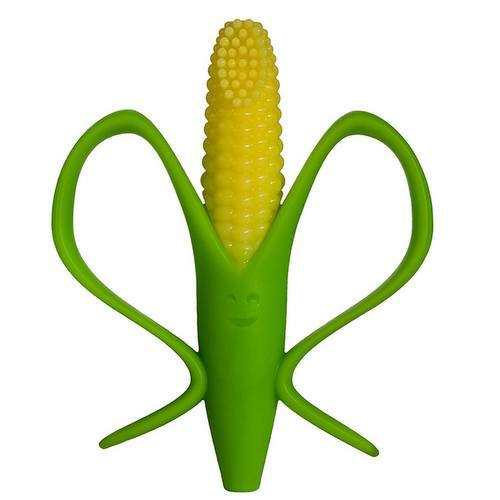 This corn-shaped version of their original design is a perfect spin to bring comfort to sore, teething gums. The corn-shaped toothbrush from Baby Banana Brush provides handles for your child's easy handling and the bumps and brush create a soothing surface for your baby to chew on. The smiling Cornelius Brush is a great way to bring some fun into teething and best of all, they can keep exploring the world while they do it! Completely safe without BPA, lead or phthalates and of course non-toxic, the Cornelius Brush by Baby Banana Brush is a must have! Advertências: Intended for children under 1 year of age. Notas: 100% food grade silicon. Dishwasher safe for sanitizing. All products pass tests for BPA, lead, phthalate, latex free. As avaliações dos clientes postadas abaixo são baseadas em experiências individuais e NÃO representam necessariamente os resultados esperados ao usar/tomar Cornelius Escova de Dentes para Bebê com Alças Bebê Banana Pincel. Esses resultados podem ser atípicos e você não deve necessariamente esperar ter os mesmos resultados. Os resultados reais podem variar.